Reflections and Ruminations: What breakdancing priests and the incarnation share in common - both can be scandalous. 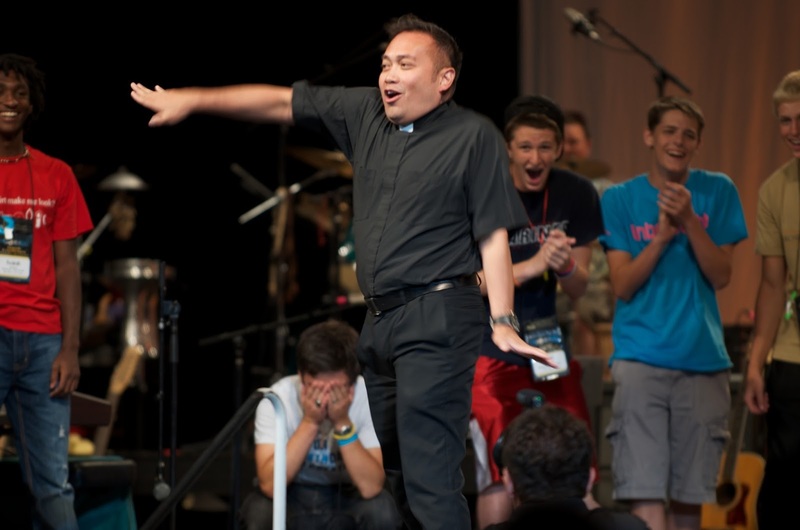 What breakdancing priests and the incarnation share in common - both can be scandalous. One of the websites that I often peruse is “Word On Fire”, which is one of the pet projects of the renowned Bishop Robert Barron of the Archdiocese of Los Angeles. In his website, not only does he have weekly entries of interesting homilies with very sound theology, he also has a host of other contributing writers giving their views of spirituality-related issues and topics. This week, something caught my eye that I thought was very interesting which may well happen here in our tiny island of Singapore, eliciting the very same reactions from the ground. One of Bishop Barron’s contributing writers, Fr Damian Ference from the Archdiocese of Cleveland, Ohio, wrote about how a 40-second video of two priests breakdancing in their clerical togs went viral, which was not surprising. What was also not surprising was the kinds of comments that this dance elicited. 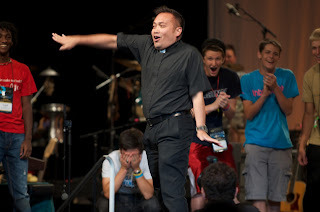 These two priests were rather young (you would have to be young to be able to backspin the way they did) and the context of their dancing was at a youth conference (presumably Catholic) in Steubenville, Ohio. Fr Damian first began his reflection by quoting (probably verbatim) some of the remarks and comments that came from the posting of the video. Some called it inappropriate behaviour, some called it an embarrassment, some said that the priests were trying to be popular, and some just said it was unacceptable. Of course, I was not in the least surprised. If I were to be captured on video attempting those moves with that kind of dexterity, I’m sure that I would get even more scathing comments. Fr Damian’s response to their comments was very interesting and worthy to be repeated. And I hope my readers will benefit from his reflection. You see, Fr Damian drew their attention to what happened at the incarnation, and applied the same comments to the mystery of God becoming man. Before the incarnation, it would have been thought that God becoming man was not only inconceivable, but completely scandalous as well. God, who is supreme, ineffable, beyond the limitations of our human ken could never and should never stoop so low as to take on the mortality of sinful man! Yet, he did – in Jesus Christ. To so many, this was just unacceptable, and even an embarrassment. When the great debate took place before the Council of Ephesus in 431AD, this was what stoked the fires of theologians and emperors! You can safely apply all those comments that the two breakdancing priests received to the debate about the incarnation of God in Jesus Christ. Thankfully, the two priests were not breakdancing in the middle of a liturgical celebration. That would be highly inappropriate, raising even my eyebrows. But they were at a youth convention, in a country where the number of nones (those who put ‘none’ in the box when asked what their religious affiliation is) is skyrocketing even as this is being read. These priests probably intended to show the young people that having good clean human fun and being holy and good Catholic priests are not mutually exclusive. Perhaps what was also foremost in the minds of the priests was that they wanted the young people at the gathering to see that priests are human before they are priests. I am sure that breakdancing was not part of their seminary curriculum. They probably had a past life – just like I myself had a past life, where I had a few slick moves myself – not at a dance floor, but at two dance schools. Our theological and spiritual formation in the seminary is something that is added-on to our humanity, and doesn’t take away what makes us human. Priests are not saints before they are ordained. Perhaps many people want us to be, and that could be a major problem. But that’s not the “deal-breaker” at our ordination. Not by a long shot. What makes it possible for us to be ordained is the grace of God, which allows for so many u-turns in life. All of us, priests and lay, are called to a life of holiness and sanctification. It is in the very ordinary things that we do (as well as the extra-ordinary things) that we apply holiness, and the ordinary things can include things like breakdancing, in appropriate places of course. I applaud what Fr Damian ended his piece with – that what is far more dangerous and scandalous are priests (and anyone else, to be sure) who would never dance in front of crowds and brightly lit arenas, but live double lives instead, dancing unseen and privately, doing so only when not wearing their clerical garb, and when cameras are nowhere to be found. Like Fr Damian, I too, am rather wary of priests who run helter-skelter from their humanity and only let their humanity manifest in the dark, like some Fr Jekyll and Mr Hide (spelt wrongly on purpose here for effect). My readers this week may think that I am advocating some kind of loose living as priests. I do not, and I certainly will not. What I am in full support of is that clerics should not disdain their humanness. What is sinful should of course be dealt with assiduously, and brought up as matter for confession each time it causes us to lose the state of grace. We are certainly not holy robots. What we must never lose is our joy. I confess that sometimes I can be in some moody state and this is never a good advertisement for joyful Christian living, let alone the priesthood. I will always remember a piece of advice given by a priest who came to the seminary leading us in one of the many days of recollection in our seminary training. He said “brothers, remember – we are not called to be consecrated refrigerators”. I’d go one further – if we find ourselves being consecrated freezers, it’s time to let things thaw. But just as the incarnation allowed the world to experience God as man, our humanness is our platform to see that we are redeemed as human persons and not as perfected saints incapable of living fully human lives. such honesty. food for thought.